I don't know about the rest of you, but the idea of a Pokemon game that played out like a turn based strategy game ala Fire Emblem was one that got me jumping for joy. I mean, they've already done turn based fighting like Final Fantasy and they've done dungeon crawling, so hey, why not an SRPG? I will admit, it is odd to have it set during the Sengoku period, but to my knowledge, it's Pokemon crossing over with an SRPG franchise known as Nobunaga's Ambition, and eh, anything to promote the latter is always a good one as not a whole lot of people know what Nobunaga's Ambition is. At the end of the day, Pokemon Conquest is a game that's a lot of fun, but just lacking in a few areas. For one thing, the story is pretty dull. I mean, it has a pretty good setup, but that's about as far as it goes. Times in the Ransei region are rough as it's wartime and everybody knows only two things - kill or be killed. But legend has it that if a warlord was to conquer all 17 kingdoms, the creator will return and bestow the chosen one with its power, and Oda Nobunaga has already started his conquest to gain this power to take over the world. You, a new warlord, must stop him. That much is enough to get you into it, but from there, it doesn't do anything interesting. It just plods on with maybe amusing at best dialogue that only gives you bits of the story... which would be fine in a bigger RPG, but not in one that only takes about 10 hours to beat. It's not at all a good story, and considering that the Sengoku period had a lot of juicy material for a potentially good story, it hurts to see it go to waste for a generic, underdeveloped and flat out fillerific coming of age story. Sadly, even the post-game has bugger all in terms of storytelling... yeah, here, you can control the different warlords. Too bad that they're not that much more interesting. Really, it's about as throwaway as it gets and it's a shame, given the source material. Then again, Pokemon has always been about the gameplay and here, it really shows. The idea is to invade all of the enemy kingdoms by defeating their warlords. To do so, you and your warriors get out your Pokemon and fight theirs'. You will commanding your Pokemon to move along a grid and to attack enemy Pokemon either on a space next to it or from a square away (depending on the attack). Individual Pokemon have passive abilities that can either raise its power when its HP is low or lower the enemy's power in battle, among other things, and individual warriors and warlords have their own abilities that can be activated before using that individual's Pokemon to increase a stat or heal it... or something, depending on what it is. However, Frozen Synapse, this is not, because what it boils down to is the good old elemental rock paper scissors we all know and love, as Pokemon have different types, like Fire, Water, Electric and so on and so forth, and each are strong against some, weak against some more and neutral to others, with very few being immune to some. Adding onto that, each Pokemon only has one attack. Thought four was limiting? That's nothing - try one! There's simplicity, and then there's limiting, and let me just say that it can feel very limiting having to deal with Pokemon who only have one attack, which is usually an attack that's their type (ie. a Grass Pokemon would have Vine Whip, a Fire type would have Ember). Thankfully, some attempts are made at making things a bit more complicated. Battlefield hazards, like boulders, lightning towers and the like, do add an element of strategy as you have to think about movement a bit more than just heading to the next enemy Pokemon, and a decent amount of the major battles will give you the objective of occupying all of the flags and sometimes keeping them occupied for a set amount of turns. On top of that, you'll be given a set amount of turns to complete battles in, but they only really have an impact on the later fights because they start to incorporate more hazards and powerful Pokemon into the mix, and that's not to mention the post-game, which can get hard at times. But as you can tell, Pokemon Conquest's combat is light on strategy and the crappy enemy AI isn't about to help matters. Put simply, they'll sometimes attack the right Pokemon and use the battlefield hazard to their advantage, but more often than not, they just go straight for a brawl with whoever they can because hey, why not? Capturing Pokemon here isn't a matter of weakening them and then throwing a Poke Ball at them. Nope, actually, what you do is that once you've conquered a kingdom, you can head inside and check out an area with Pokemon in them. Some or all of them will have warriors in there, and if you go in there and beat them within 4 turns or with a super effective attack, you can recruit them. Not only that, but after you get a little into the game, you'll be given the option to let your troops link with wild Pokemon by getting their Pokemon to walk up to it and use the Link command, then press the A button at the right times to establish that link. Now, this can get a little needlessly complicated, because Pokemon work at their best with certain warriors, but you can't tell who is best suited to be that Pokemon's master... unless you look it up on the internet or save before capturing Pokemon. Even then, it's one Pokemon per warrior in any given battle, so you'll have to choose between his default Pokemon and the one that he established a link with. Mind you, you'll still have a functioning Pokemon, but if you get the wrong combination, you'll end up with a subpar Pokemon... and if you're wondering, link also refers to experience points, so the more you battle with it, the more you two will link together, or the more it powers up, and getting that high enough (and sometimes fulfilling another condition) will allow them to evolve. Now, one thing that could've been really big is the management of the kingdoms that you've taken over. The idea of this is to recruit a bunch of warriors so that they'd be able to keep watch over your property while you proceed to take over other kingdoms. But what should make this interesting is that any enemy warlord can storm in and take over one of your kingdoms, which is where your other guys come in. Well... don't expect this to actually happen until you finish the game and get into the post-game. Throughout the entirety of the main campaign, I think I only got invaded once. Even then, it's easy to reclaim it by defeating that warlord. Even if your kingdoms did get invaded, managing them is easy anyway. The most that you'll ever have to do there is find warriors to recruit and mine for gold, maybe make some improvements here and there... but it's all rather basic and feels like an afterthought because hey, Nobunaga's Ambition has this, and we want to make a game like that... but for kids! 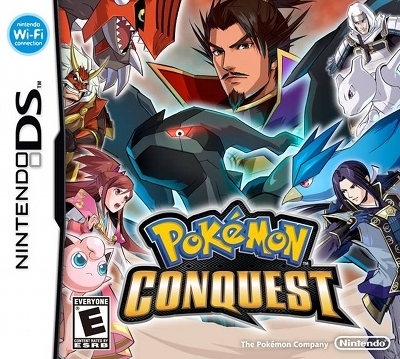 If there's any saving grace, it's this... Pokemon Conquest is a fun, fun game to play. Game Freak have made a killing on games that are tons of fun to play because of their simple pick up and play nature, and really, this game is no different. It's easy to get into and it's easy to sink a lot of time into because, despite some oversimplications, it's still requires you to put together a decent team - or in this case, a bunch of decent teams of Pokemon - and working on keeping them strong enough to take down enemy kingdoms. Really though, it won't be all that fun until you're done with the first few kingdoms, before it gets harder with more objects that can force you to think a little more strategically. Plus, there's the post-game, which ups the ante in this department. Ordinarily, this could completely redeem a game - how else do the Pokemon games stay alive for crying out loud - but not here. It just gives the game a leg to stand on. What may strike as a surprise is that the sound design is actually pretty dull. Usually, Pokemon games and the anime have great music that will be stuck in your head for days, weeks, even years. Here? I'm struggling to remember any of the songs, and they didn't really aid me in immersing me into the region of Ransei. It just felt like it was there. The only other way to describe the music is that it has that feudal Japan feel to it, in that it's meant to go with epic samurai battles. Eh, it didn't do much, especially for the Pokemon battles. The sound effects are also fairly pedestrian, not really doing much, although they're at least more memorable than the songs. At least the Pokemon cries are still there... but yeah, pretty middle of the line, which is pretty disappointing for the Pokemon series. Ah well, you get dealt a bad hand every now and again. Fun is fun, but it doesn't do as much to make up for the lack of Pokemon attacks and silly AI as it could've. SRPGs are a very different beast from regular JRPGs and dungeon crawlers, requiring there to be more tactical options than just "move to enemy and use the one attack your unit has". This makes Fire Emblem look like Frozen Synapse, and while it's still fun, the lack of depth can be really bothersome. The lack of a compelling story is also a bit of a bother. The lack of a good soundtrack is not only surprising from a Pokemon game, but also very disappointing. To be fair, none of its flaws outright destroy the game because like I said, it is fun to play, but it really does make you wish that more could've been done to make it a better game. Ah well, at least they tried, and at least they showed that the SRPG style CAN work... just give it some work, make a new series out of it and viola, a series we can all get behind. At this point, what we have isn't bad, but it could be a lot better.